The secrecy surrounding the camp has frustrated longtime residents of Tornillo and alarmed lawyers and advocates who question its conditions. TORNILLO – About 40 miles southeast of El Paso, past the billboards for fast food joints and rugged desert hills, residents of this small community sometimes can see the lights of the nearby detention camp glowing in the night. There is one local organization that gets inside the camp regularly: Diocesan Migrant & Refugee Services. The El Paso legal nonprofit is among dozens of groups funded by the government to provide legal services to immigrant children in custody. But lawyers at Diocesan Migrant & Refugee Services, known locally as DMRS, can’t speak publicly about the children at Tornillo. Their contract prohibits them from talking to the media, Executive Director Melissa Lopez said in an interview. It’s another aspect of the conflict of interest built into the funding for legal aid, which also prevents lawyers from taking the government to court to get children released. She referred questions to the federal Office of Refugee Resettlement. “It’s better for the details to come from them,” she said. The agency has not responded to a request for comment. When it opened over the summer, the camp was meant to be a temporary home for children ages 13 to 17 caught crossing the border alone. But with a growing population and a contract to keep it open at least through December, the camp is taking on a role similar to the government’s permanent shelters for unaccompanied migrant children. It can now accommodate up to 3,800 minors. The secrecy surrounding the camp has frustrated longtime residents of Tornillo and alarmed lawyers and advocates who question its conditions. After a tour of the tent city Sept. 24, advocates left with concerns that children were given only workbooks, but no other education, and less access to mental health counseling than found in other shelters. There is also evidence that children aren’t getting the legal representation they need. The town’s representative in the Texas Legislature, Democratic state Rep. Mary González, said she is particularly concerned that the children aren’t receiving adequate legal help. During a recent morning at immigration court in El Paso, she saw several minors from the camp appear before a judge without a lawyer, González said. However strained the group has been, its contract prevents officials from complaining publicly if children aren’t getting representation. There is someone who can talk about life inside the tent city. Over the summer, a 17-year-old boy named Bruno left Guatemala and traversed 1,800 miles on buses, semitrailers and trains until he reached an El Paso port of entry in July. After more than a month at another Texas shelter for immigrant children, Bruno was transferred. No one told him why, he said. Reveal is not using his full name due to concerns that his decision to speak publicly about Tornillo may affect his pending immigration case. Bruno arrived at the Tornillo camp at night. He saw the tents and asked a worker where he would be sleeping. “Here,” the worker told him. His friends called the camp “el infierno,” because of the sweltering summer temperatures. The teens were allowed to play soccer only early in the morning when it was cooler outside, Bruno said. He remembers one week when the air conditioning in his tent stopped working. 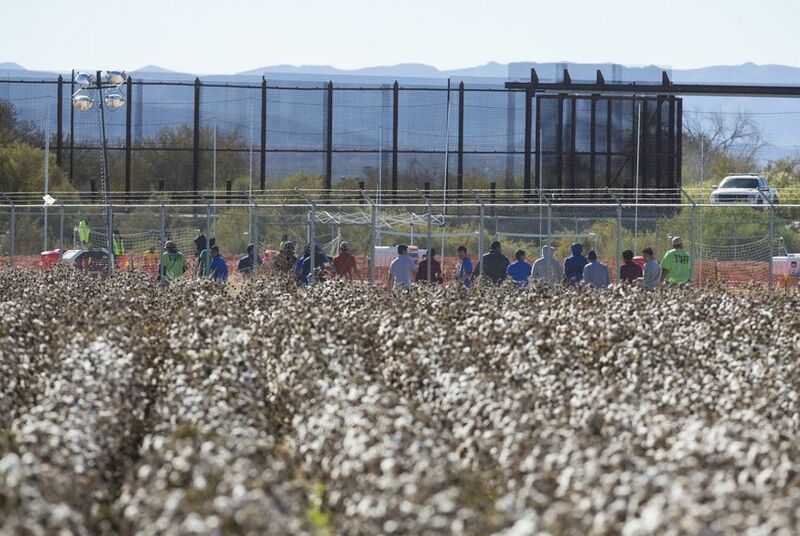 Children sent here were supposed to move through Tornillo quickly, on their way to placement with family in the United States while they awaited a court date. But the government’s placement process has stalled. Roughly 90 children have been held at the camp for more than three months, according to recent court filings. BCFS Health and Human Services, the contractor running the camp, has said many of the teens stuck at the camp for months were awaiting fingerprint results for their prospective sponsors, according to a court declaration from Leah J. Chavla, a visiting attorney from the Women’s Refugee Commission. In her declaration, Chavla said hundreds of children “were not far along in the reunification process,” including more than 150 who had no viable sponsors. During his seven weeks at Tornillo, Bruno remembers seeing an attorney who asked him and other teens about conditions at the camp. But he never met with a lawyer about his case or his legal rights, he said. He tried to stay hopeful and followed orders from the staff. Bruno slept with 19 other boys in a tent lined with bunk beds. Workers taught the teens how to make bracelets. He went to church services at the cafeteria. Bruno was released from the shelter Sept. 22 and reunited with family. He searches Facebook for the friends he left behind at Tornillo, hoping some may have been released and have access to social media. So far, he hasn’t found them. As sweltering summer days at the tent city have given way to freezing fall desert nights, more and more of the children living there are going to court. Iliana Holguin, an El Paso immigration attorney, said her understanding was that, since Tornillo was a temporary shelter, children weren’t supposed to face immigration court while being held at the camp. “We always were under the impression that the Tornillo kids were not going to be appearing in court here in El Paso because it was considered a temporary shelter,” Holguin said. Today, that’s all changed. Children are hauled from Tornillo to El Paso’s downtown immigration court as many as four days a week. Without their families and, in many cases, without the legal help to which they’re entitled, they’re forced to make major decisions like whether to return to their home countries or whether to seek asylum. Detained migrant children are entitled to legal representation under federal law. Diocesan Migrant & Refugee Services’ federally funded legal aid contract includes doing that work. But on Oct. 11, according to a BuzzFeed report, 11 children from Tornillo faced a judge with no legal help, only a representative from BCFS Health and Human Services, the contractor that runs the shelter. The following week, González, the state lawmaker, went to court to see for herself. This time, she said there were about 10 children, most in their mid-teens. González said there was an attorney from Diocesan Migrant & Refugee Services present – but only to give advice as a “friend of the court,” not to represent the children. Instead, she said, they were given a list of pro bono legal resources – in English only – which includes DMRS and five other groups, one of which won’t take clients who are in detention. It was clear, González said, that children weren’t getting the help they needed. Most were making their first court appearance and asked the judge for later court dates to prepare their asylum claims. One of the minors was a 12-year-old boy from Guatemala, González said. It was his fourth court hearing, but the first in which he had access to a translator who spoke his indigenous language. Rather than seek asylum, she said, the boy agreed to be sent back to Guatemala. Without answers from DMRS or the federal government, it’s unclear how many of the children at Tornillo are getting legal representation in court. Another group on the list of pro bono legal providers that children are given is the Las Americas Immigrant Advocacy Center. Its director, Linda Rivas, said in an email that she has not received calls from children at Tornillo seeking representation. But she’s not surprised, because she knows that DMRS has a contract to represent them. Holguin was the legal aid group’s executive director from 2006 to 2012. She said DMRS will have to hire more lawyers to do the job. “I’m sure they didn’t have staff members to absorb that demand,” she said. If lawyers with the group already are frustrated by the sudden increase in clients, they can’t say so without risking their government funding. “The attorneys at DMRS are very hesitant to disclose something that would cause ORR (the refugee office) to potentially risk their contract, leaving these children without representation,” Holguin said. When Alfredo Escalante first heard about the encampment, he headed to the shelter with a few other residents and hauled goods, such as soccer balls and home-grown watermelon, for the children. But a guard at the gate told them to leave. Escalante and other Tornillo residents joined protests outside the shelter at the height of the Trump administration’s policy that separated roughly 2,600 immigrant children from their parents at the border. In conversations with school staff, Superintendent Vega-Barrio said the camp comes up often. The district has requested access to the shelter through local lawmakers, but hasn’t received a response. Vega-Barrio described the town as quiet and family-oriented. There are reminders of the town’s new neighbor. The lights illuminating the tents at night can be seen from the high school stadium. Large white buses heading to the camp sometimes cut through Tornillo. Surrounded by desert and cotton fields, the town with no traffic lights has one mom-and-pop grocery store and a gas station. On a recent afternoon, Escalante’s mother waited for customers to arrive at her hair salon, which she runs out of a small brick house in her backyard. People in town talk about the shelter, Maria Escalante said. Many are sympathetic to the children because they’re separated from their families and living in a strange place. Some residents, she’s heard, now are working at the camp. Editor's note: This story is by Reveal, from the Center for Investigative Reporting.